Connie Gilchrist, Actress: Cry 'Havoc'. 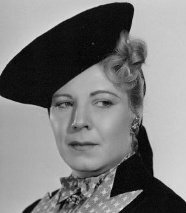 With more than two decades of stage experience in France, England and on Broadway behind her, this moon-faced, heavy-set character actress first entered films in 1940. But no matter a film's genre - contemporary drama, historical costumer or shoot 'em up western - her Brooklyn roots always sounded through.